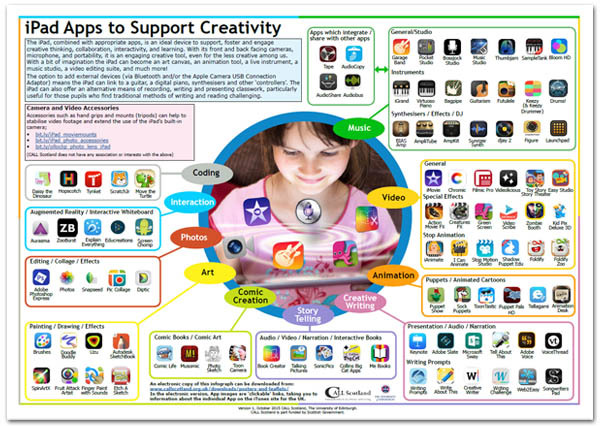 The iPad, combined with appropriate apps, is an ideal device to support, foster and engage creative thinking, collaboration, interactivity, and learning. With its front and back facing cameras, microphone, and portability, it is an engaging creative tool, even for the less creative among us. With a bit of imagination the iPad can become an art canvas, an animation tool, a live instrument, a music studio, a video editing suite, and much more! The option to add external devices (via Bluetooth and/or the Apple Camera USB Connection Adaptor) means the iPad can link to a guitar, a digital piano, synthesisers and other 'controllers'. The iPad can also offer an alternative means of recording, writing and presenting classwork, particularly useful for those pupils who find traditional methods of writing and reading challenging.